The vast majority of enthusiasts visiting Japan make use of the superb public transport system to get around. There are very few places that cannot be reached by a combination of trains and buses, but there's a catch; some of the more obscure locations tend to be served only a few times per day, typically with outbound journeys in the morning and returns in the evening. Additionally, some of the dedicated buses only run on weekends outside of school holidays. The solution is to use public transport to get to a general area then hire a car locally. Western agencies are not well represented in Japan, but there are several local brands that accept International Driving Permits, including Nippon, Nissan, and Toyota, and a typical daily rate is around ¥6500 (~€48) including insurance. The rental procedure is no different to anywhere else in the world, with the only oddity being the requirement to present a fuel receipt when returning your vehicle. The agency will tell you which garage they expect you to use, and the prices don't tend to vary much so it's as easy to go with their recommendation. 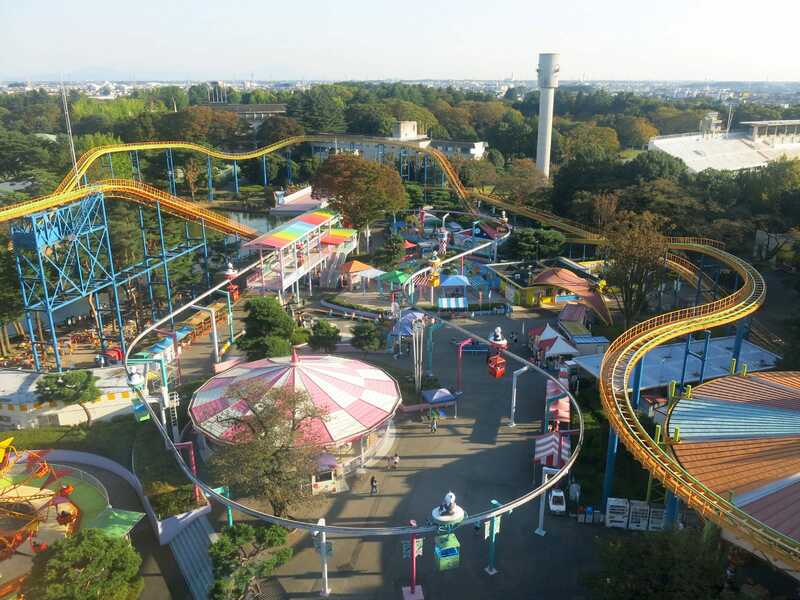 Koriyama Dreamland is located roughly 5km from Asakanagamori Station. An alternative (and easier) access route is to drive from Utsunomiya Station, which has a direct motorway for almost all of the 113km trip. The only thing to be aware of is the road tolls, which today came to ¥2900 (~€21) each way, a rather frightening amount of money given the distance involved. The park is one section of the Koriyama Cultural Center complex, a multipurpose community facility that also includes an indoor basketball court, classroom facilities, and a water park with a lazy river and tube slides. The ride area has a total of eleven attractions anchored by a substantial Jet Coaster (#2165) whose structure is clearly visible from the main road. This ride (¥300) was bigger than I'd anticipated from photographs, and the layout was also surprisingly lively, with respectable drops and even a little airtime in the back row. As we were the only people riding the operator was quite happy to let us take photos, and even offered to take some for us. The park also had a twenty-car wheel (¥100) painted in a striking yellow and orange scheme. The cars were enclosed, but there was enough of a gap in the window to point a camera lens for the obligatory overhead shots. Utsunomiya Zoo can be reached by a bus from the west exit of Utsunomiya Station, but only if one is prepared to spend an entire day on site, which would be a bit much for the average enthusiast. We drove from our previous stop in just under ninety minutes, and we'd have done it in less with more accurate maps. We opened our car doors to the unmistakable sounds of a zoo; chirping birds, rustling branches, and excited children. 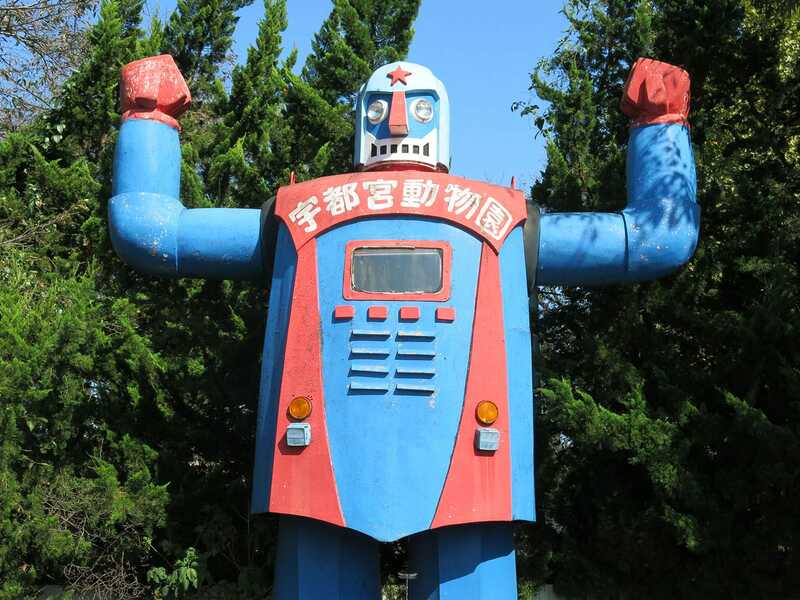 The volume seemed unexpectedly loud for the middle of a car park, and sure enough a brief investigation revealed it to be coming from a speaker system hidden inside the body of a twenty foot tall robot. The thirty second loop sounded like something from a computer game, and bore absolutely no relation to the reality we were about to discover. Admission cost ¥1200 (~€8.80), and as we walked through the gate my immediate reaction was that we'd overpaid. On our left stood a drained swimming pool with two slides that had apparently closed for the season, and on our right stood a whole variety of shops selling what could only be described as junk. There was slight odour of animals, and we followed our noses in that general direction only to discover a white tiger curled up in an enclosure that was far too small to be considered humane. His appearance was more than a little upsetting, and rather than see more of the same we elected to skip over the remaining exhibits. Instead we headed into the ride area and attempted to acquire ride tickets. This looked like a formidable challenge at first, given that the signage had no pictures and all the labels were in Kanji, but after a bit of back and forth through voice translation software the cashier produced a binder with photographs and allowed us to point at what we wanted. I'd totalled the expected price in my head, and handed over the requisite amount only to get the majority of it back; the nice man had realised that wristbands would be cheaper for us, and thus sold us those instead. The contrast between this experience and other parts of the world could not have been more dramatic. The imaginatively named Coaster (#2166) was operating with a single train with the figurehead of a lion. The track featured the gauze structure and triangular hills seen at Musashi-No Mura, albeit on a smaller scale; the layout had clearly been designed around a minimal top speed, and the various drops were typically no more than five feet at a time. We did three laps, two in the front and one in the back, and neither of us noted any particular difference between seats. The best photographs were available from the nearby Monorail, an elevated loop operating with six-seat circular cars decorated with assorted zoo animals on the outside. While in motion the ride system played a rendition of the Mickey Mouse March on a SN76489 that began to grate after about thirty seconds. It was impossible not to feel a certain amount of sympathy for the poor operator forced to listen to that jaunty tune over and over and over again. 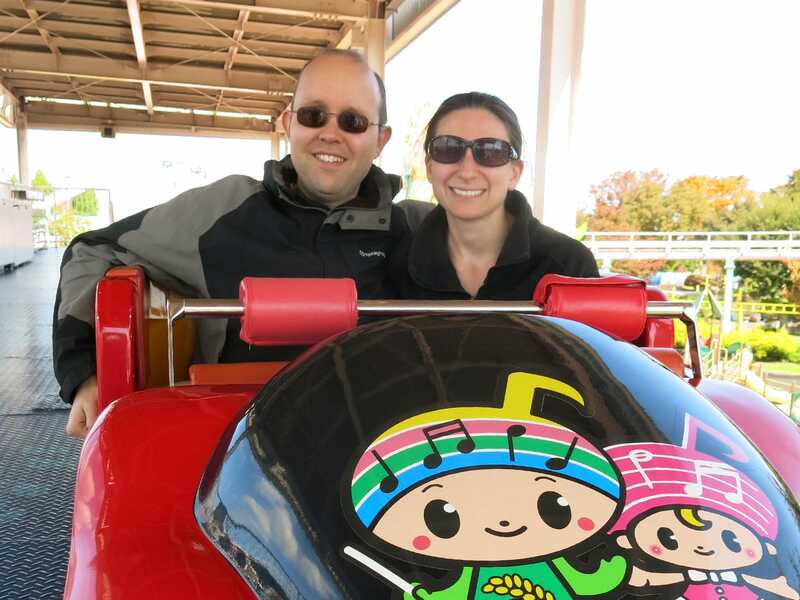 An obligatory lap on the fully enclosed Ferris Wheel left us with just one more target for our visit, namely Adventure, an unassuming dark ride decorated with a ten foot high green dinosaur. The scenes inside were of far higher quality than the building's outward appearance would have suggested, though they were somewhat disjointed; crocodiles, hippopotami, and gorillas were joined by a pair of green and blue aliens. There was also a flexible foam barrier at head height that would not have been out of place in a haunted house. There are several large official parking areas for Tochinoki Family Land, but our intrepid GPS was unable to get us to any of them thanks to two closed roads and a confusing one-way system. After fifteen minutes of driving in circles we gave up and paid ¥500 to use a privately operated lot located near a side entrance. An alternative and somewhat less stressful route would have been to walk from Nishikawada Station located about a kilometre away. Walking into the park felt a bit like walking into the middle of a rainbow. Several of the flat rides sported multicoloured paint schemes, and the Jet Coaster (#2167) looked particularly dramatic thanks to its orange track, green rails, and blue supports. Despite its impressive appearance, however, the ride did very little; there were a grand total of four drops in a layout comprising just over seven hundred metres of track, and the vast majority of the course was straight and level. That said, the tracking was for the most part completely smooth, with only minor vibration at the base of each drop. We rode twice, once in the middle of the train and once in row three, and we didn't notice any differences between the seats. After a brief walk around the park for photographs we decided that we might as well do a lap on the wheel (¥300) despite the lack of air conditioning. It wasn't possible to get the entire coaster in shot, unfortunately, but I did get most of it.